I've been focusing on the Dot Torture. I see it in my sleep sometimes, I swear! 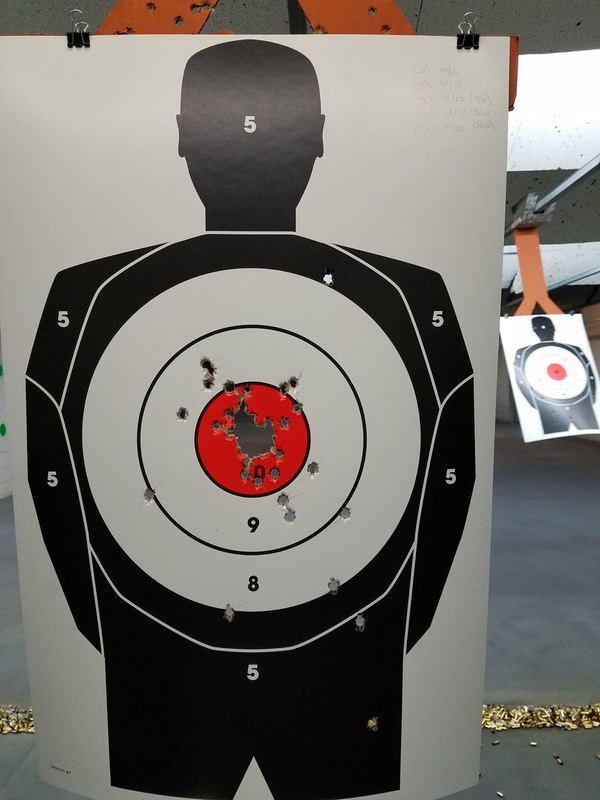 I've now cleared it right-handed at 3 yards with three of my pistols: GSG 1911-22; Glock 42 (.380); and my Para-Ordnance 1911 (.45). I even cleared it last week left-handed at 3 yards with my GSG 1911-22. Still need to shoot it clean with my G42 and Para. I do love the Dot Torture and it has improved my shooting by leaps and bounds, but I feel like I was eating, sleeping, and breathing Dot Torture, so when a new drill showed up on my Facebook feed I decided to give it a try. I've seen it before, but had forgotten to write it down or save it. This time I remembered. It's the Tactical Professor's "Baseline Evaluation" that I stole from Active Response Training (that he re-blogged from Tactical Professor). This was a fun, quick drill, five sequences of ten shots. Though untimed, it does require one to focus on the fundamentals. One of my failures is that if I start from a low-ready, I tend to overshoot my target on the first round (for example, my first round ends up as a head shot instead of a body shot). 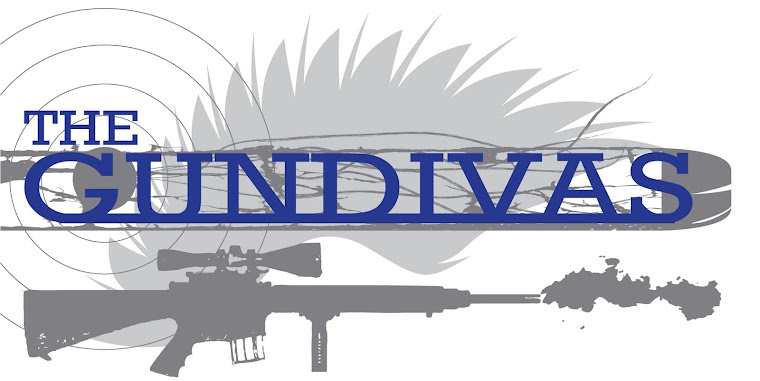 This is a great drill for remembering to slow down and find that front sight. 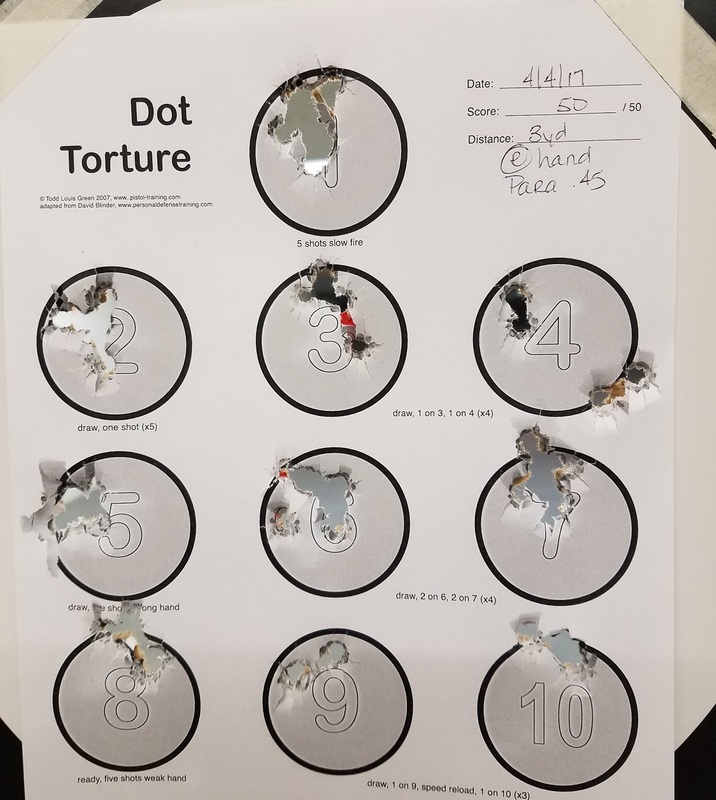 There is also one mag change per sequence, and I found that I'm fairly accurate with my first round after a mag change (thanks to dots 9 and 10 on the Dot Torture). The instructions say to mark your target after each sequence with a pen or with masking tape. I forgot about those instructions when I shot the first couple of tehm. 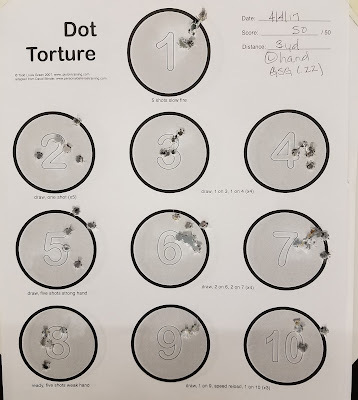 When I got out to 7 yards and threw my first couple of rounds out of the 10-ring, I thought I could remember which rounds were which, but by the time I got to 10 yards, I had to start marking. I'm waiting on my IDPA targets to arrive, so I used the silhouette targets that the range had. I scored my target in two ways for each distance: the first score was total rounds in the 10-ring; my second score was total rounds in the 8-ring. I'm sure that once I get the IDPA targets my scores will change somewhat (worse, I think, because I found the 8-ring really generous). Even with the generous 8-ring, I threw the last two rounds of my last string at 15 yds. Total 37/50 in 10-ring; 48/50 in 8-ring. I switched to left-handed with my GSG and remembered to mark the targets after each sequence with masking tape. It makes for an ugly target, but one that is much easier to score. One day, I'll stop pushing to the right with this gun. Total 29/50 in 10-ring; 50/50 in 8-ring. 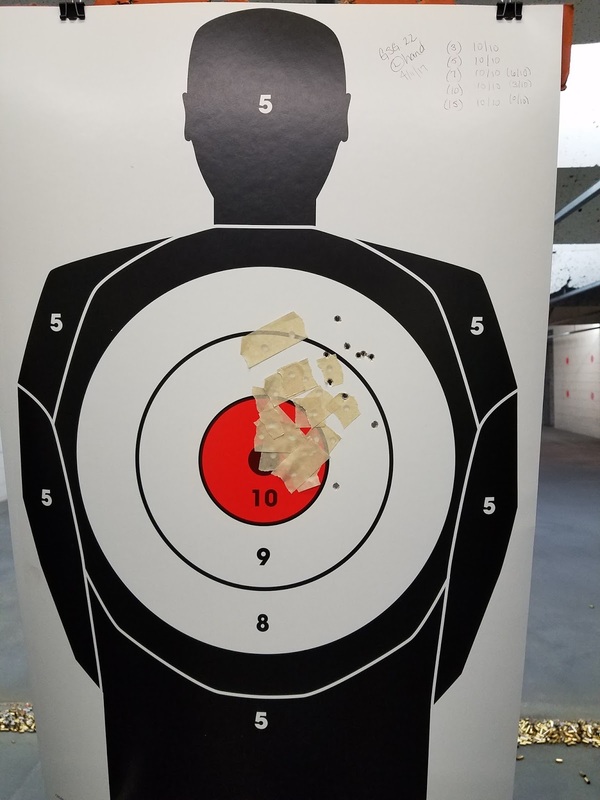 I still had time and 20 rounds left, so I brought the target in to 3 yards and shot 10 rounds left-handed, and 10 rounds right-handed. My left-handed group was much tighter, but just to the right of center, than my right-handed rounds. I did have an experience at the range for the first time that I'm not thrilled with - there was a new(er) shooter in the lane next to me who had a hot piece of brass go down her shirt. I get it, it's hot. However, you don't get to jump around in your lane waving your gun around. She got an ugly, pissed-off instructor look from me, and a terse "watch your muzzle!". She was quite apologetic and I hope she learned a lesson about muzzle discipline. I never want to discourage a new shooter, but I also don't want anyone getting hurt. Please, if you are teaching someone to shoot, or even just taking someone shooting, tell them in advance what to do if they get brass down their shirt. If you shoot often enough, it's going to happen and it shouldn't have tragic consequences. If the new shooter knows what to do in advance, then they will have a plan in place.